[HAPPY VIETNAMESE TEACHERS’ DAY] What do students think of their teachers? As Vietnamese Teachers’ Day 20/11 is nearing, Ams Wide Web has asked some students about their teachers, along with some of their prominent memories of school, and about this significant celebration itself. 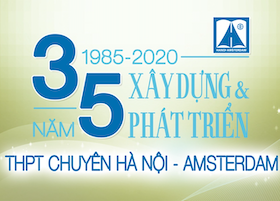 Join Ams Wide Web as we discover some truths untold about these students of Hanoi - Amsterdam High School for the Gifted! Reporter: Hello. As you’ve known, students across the country are going to celebrate Vietnamese Teachers’ Day in a few days. For you, what have you prepared for the upcoming event? Nguyen Vinh Khanh (11 Math 1): As for me, these days, I’ve set my heart on getting the best grades as possible at school. I think that academic progress is the most precious present I can give my teachers as a tribute in the upcoming celebration. Also, there is a little secret I’d want to share with the readers! My class has prepared a special and unique gift for our teachers for the Vietnamese Teachers’ Day, so please look forward to it! Reporter: Hello. As Vietnamese Teachers’ Day is nearing, I presume you’ve held onto some special memories about your teachers, right? Can you share some of such memories with our readers? Đoan Hong Trang (10 Literature): Prior to the 8th grade, students have to sit for an assessment test to rearrange the classes. A few days before, an unforgettable tragedy struck: my venerable grandfather passed away. At that time, I was so dismal that the depression affected my exam results severely. When my mother came to this, I knew that in addition to the pain caused by my grandfather’s passaway, she’d also be disappointed by my poor exam results, so I felt extremely guilty! On the first day with my new class, my homeroom teacher, Miss Bui Hanh Quyen, put forward a suggestion that all students record a video containing what they want to say to their loved ones - and in my case, my mother. When the video was shown in the parents’ meeting, my mom was completely taken aback and overcome with emotions, and after this event, we get to understand each other significantly more. Therefore, I really appreciated Miss Hanh Quyen for giving me the opportunity to express my deepest feelings to my mother, and to this day, I still do. Maybe, this isn’t really a memory, but still something that I simply cannot forget. Nguyen Minh Huyen (9D): People ofter stereotype girls to always be good at Literature because they are supposedly romantic and dreamy, but this isn’t the case for me - I dread this subject. However, when I was in 6th grade, I had to chance to meet “a fairy on Earth” - Miss Tran Thi Luyen. I have always remembered what she once said, “Don’t think of literature as something purely fictional or vain and don’t think of Literature learners to be all romantic or dreamy. Becoming good at Literature can be quite simple, just pour your heart out, along with your distinctive character, on the papers. Don’t write like a photocopier as individuality, to a writer, is of paramount importance.” Since then, the love for literature is gradually built up inside my heart, and this passion has proven to be fruitful as last year, I won a prize in the Literature Contest for Excellent Students. For me, she is not only a dedicated teacher devoting to her career, but she is also like a kind mother providing guidance for her children in order for them to improve and develop themselves day by day. I just want to thank her for not only inspiring me with a fire inside my heart and a passionate love for Literature, but also for guiding me how to behave and grow up. I will always love and appreciate you - the “second mother” of my life. Reporter: Hello. As Vietnamese Teachers’ Day 20/11 is nearing, can you send your warmest and earnest wishes as a tribute to all the respectable teachers, the silent ferrymen in this significant celebration? Le Nhat Thanh (10 Chemistry 2): Even though teachers write with white chalk on a black board, my life has been filled with colors thanks to you. For this 20/11, I hope that all teachers will always be young, healthy, happy with your families, and successful in your career. I hope that all teachers will receive immense love and support from all of their students! Nhat Thanh and her earnest wishes for her teachers for the celebration. Vietnamese Teachers’ Day is nearing, so let’s all work together to create a memorable and meaningful day for our teachers!